If we compare to the road bikes, mountain bikes are more versatile and have great control. For exercise and day to day, general use MTB is worth is value for money. Also for commuting purpose, it will be a great choice. so aluminum got the preference. Compared to steel aluminum frame has a less lifetime which generally lasts for 3 to 5 years where steel frame has better durability than aluminum. Carbon fiber frames are used in professional and costly mountain bikes. As we are talking about the budget-oriented bikes so aluminum frames are the best choice as it is lighter. The fork is of two types with suspension and without suspension. A rigid fork doesn’t have the suspension and it is good for commuting on flat roads. But if you ride on a bumpy road then you may consider the suspension fork. 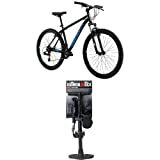 The hard trail mountain bikes have only one suspension on the front fork while the off-road mountain bikes have both front and rear suspension. Keep in mind in budget-oriented bikes the front adds an extra weight to the bike. Now 26”, 27.5” and 29” wheel is available. But which to consider? Let’s first differ the common scenario 26” has better riding control with great acceleration where 27.5” and 29” has better speed but hard to accelerate. 27.5” and 29” can maintain the speed better than the 26”. Now three types of brakes are available: inline V-brakes, mechanical disk brakes, and hydraulic disk brakes. V-brakes are good but not for all conditions, in the wet conditions, it cannot perform like the disk brakes. The mechanical disk brake is better compared to the V-brakes for wet condition. And the hydraulic disk brakes are used in expensive bikes and has the best braking performance among the brakes. In budget oriented bikes V-brakes and mechanical disk brakes are widely used. Not only for controlling effort for ease but also for maintain speed and adjust the perfect transmission. Shimano Derailleur or SRAM derailleurs are very famous in the market. Front and Rear derailleurs combination denotes the speed transmission. This is one of the most affordable MTB of 2016. 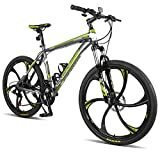 Have good components considered to the price point and as an entry level mountain bike? The Suntour fork is widely used in low and medium budget MTB’s worldwide and it has a dual suspension with 24 Speed gears. As it has an aluminum frame it is lightweight with heavy strength along with dual suspension it is designed for off-road biking as well. It will be comfortable for day to day use and workout. Pros: Has good components from renowned components manufacturer. Cons: Rear brake is inline v-brake where front is a disk brake. This entry level mountain bike has decent components. Good frame, 21 Speed transmission, Single suspension fork for ease and smooth bumps. For daily commuting or cross country riding or a little off-road riding, this bike will not disappoint you. For a comfortable ride, it will be good enough. Pros:Mechanical Disk brakes in both front and rear wheels, 80mm travel suspension fork, Heat treated aluminum 6061 frames. Cons: Speed sifter and derailleurs are very ordinary for the price point. Has entry level components. It has an aluminum frame with 60 mm Suntour fork, SRAM derailleurs. For the price point, you are getting a very good brand value. But considering components it may not perform well on off-road tracks. But for commuting or exercising it will be a good companion for a workout and daily use. Pros: Disk brakes in both wheel, Standard frame materials. Cons: Weight is little heavy. Pros: SE 1 alloy frame. Cons: 50 mm Fork, inline v-brakes, older components. Pros: Mechanical disk brakes on both front and rear wheel, 80 mm fork for smooth feels on bumpy roads. Pros: Cheap price, decent build. Pros: Dual suspension, Front mechanical disk brake, 24 Speed transmission. 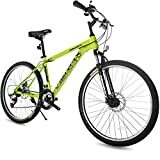 29” wheels with dual suspension Mongoose Impasse Dual Full Suspension Bicycle can be considered as one of the most comfortable mountain bikes in this price segment. Has a decent outlook. Pros: Dual suspension, great geometrical design, dual disk brake. The Fat bikes are usually made for riding on sandy roads. Those bikes are not for day to day use. You can purchase one as your hobby. But if you think to use it for commuting, just forget it. Pros: Fancy use, ride on a sandy area or road. Cons: Not comfortable to ride regularly. After reading all this, you may be confused what to buy? Right! Don’t be disappointed, there is a lot of manufactures with hundreds of best affordable mountain bikes are available in the market. But one thing to remember, to keep the price low many compromises with quality. You shouldn’t only consider the component of the bikes. Because the components can be upgraded at any time. So build quality and the frame quality must be considered. The design and geometry of the frame are very important for getting a comfortable feeling from your bike. We considered some important fact to decide what to buy. First of all, you need to decide, for which purpose you are going to buy a mountain bike? On which type of surface are you going to ride? Considering this you can easily choose one from the above list. If you want to use your mountain bike for commuting purposes. Then you may consider the bike has no suspension fork. As suspension fork adds extra weight. On flat roads, those mountain bikes get good speed and a comfortable ride. Budget mountain bikes don’t provide good quality suspension fork, this is why rigidity of fork and frame should be the first consideration for purchasing a mountain bike for consideration. If you want to ride both on-road and off-road. Then you may consider the hard trail mountain bikes. Because it’s comfortable to ride on rough terrain and the front suspension fork will give you smooth feeling on the bumpy roads. For extra comfort, you can consider this type of mountain bike. If you want to use your mountain bike for using off-road and on the heavily rough terrain then you must consider the dual suspension fork mountain bikes. Budget bikes don’t offer good quality components and suspension fork. Those suspension forks are heavier. So buy those cheap budget dual suspension mountain bike only if you want to ride on rough surfaces. First, fix your budget for buying your Best Affordable Mountain Bikes. Then search for the best available option for you. Be sure that you get the maximum benefits from your mountain bike. Don’t compromise on every portion. As cheap bikes don’t fulfill all the demands, so carefully compromise with the things which are not necessary for you. For the entry, you don’t need to spend more. You can find a very good bike in a price range of $400-$500. The component bikes below this price range will not be good enough like those are on $400 bikes. Don’t only consider the outlook. Compromise little and get the maximum. The components may wash out in a couple of years. You may need to change some components and tires might be replaced within one year or two. Finding a Best Affordable Mountain Bikes is not an easy task. If this is the first time you are buying a mountain bike it won’t disappoint you. Nowadays mountain biking is a great fun and a very good hobby. For daily usage or workout, mountain bikes are considered by a large number of people. Please don’t spend all your budget only on the bike that you are purchasing. Because before the first run we advise you to take your bike to a professional technician to fix it and check all the components installation condition. Save some money for further repair. You also need some gears like a helmet, tail light, front light, lock etc. for your mountain bike. The lock is just as you may need to park it outside of a shop or some other place. Thanks for reading this article. Hope it will help you to decide what to choose and what to buy.